Today has been one of those really satisfactory days. Classes ended for the semester last night, I woke up this morning after a full night of sleep ,refreshed and ready to get back to the pool (being sick is so frustrating energy wise, it’s good to be back to normal), swam a mile, caught up on Top Chef (sigh…is Atlanta cursed in the finale or something? Kevin better win fan favorite), and bounced into the kitchen ready to try something new, creative, and, most importantly, colorful. It’s a beautiful day outside–sunny, windy, crystal blue sky, brisk air–and I wanted to mirror nature’s gift with something incredibly, and naturally, colorful. 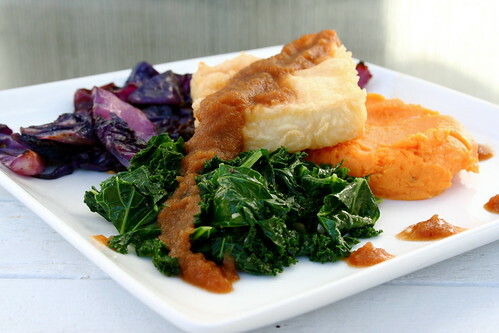 I already had some sweet potato puree leftover from the sweet potato cream cheese frosting, so that made the list, and after a quick look-see of the fridge, I emerged with a bag of local kale, a three pound head of local purple cabbage, and a block of tofu. Remembering that I have the all-too-awesome-for-words circa 1973 Fry Daddy, I figured, to celebrate the end of the semester, I might as well deep fry the tofu. Any excuse is a good excuse for deep frying, really. Then, thinking of my love affair with brussels sprouts, I decided to chop the cabbage into wedges and roast it at 450 F with olive oil, salt, and pepper until they were soft in the middle with crunchy outer leaves. If you haven’t roasted cabbage yet, get on it–just as delicious as brussels (maybe not as cute), and definitely cheaper. I also blanched and sauteed some of the kale with garlic. The one thing left was a sauce. I could have grabbed the bottle of Jonesville BBQ sauce I have in my fridge, or I could have made a nice gravy, but I wanted something a little more interesting, something I haven’t tried yet. That’s when I remembered the kimchi sitting toward the back of my condiment shelf. After spending a minute or two wondering if I were off my rocker, I went ahead a pureed it and then cooked it down with some brown sugar. Oh man, I’m really glad I did. It turns out a little like BBQ sauce, with some different fermented (of course) flavors mixed it. Earthy, hot, sweet, and tangy, the sauce was a perfect condiment with the meal. All in all, I’m pretty darn happy with the plate (although I wish I were better at plating, or at least invested in some squeeze bottles for sauces) and ready to get to work on the final revisions so the semester can completely end. In a blender (or food processor) puree the kimchi with the water until smooth. If you want a very smooth reduction, drain the liquid out with a cheesecloth or fine mesh strainer. Transfer the liquid/puree to a small pot. Over medium heat, bring the kimchi puree to a boil, then lower to a simmer. Stir in the brown sugar and simmer for 10-15 minutes, stirring often. Serve over protein of choice, refrigerate for later use. Roasting! That is totally what I should do with my 1.5 massive green cabbages currently filling practically the entire crisper! Thanks for the excellent idea. I never would have thought of that but I’m definitely going to try it! The whole meal looks like a great way to celebrate the end of the semester and feeling better. This may be the thing that gets me to give kimchi another chance! Also, roasted cabbage is so delicious! I hope we get cabbage from veghub sooon! How interesting! Roasted cabbage is one of my most favorite things. hooray for classes being out, swimming fun, deep fried tofu goodnesses, and one helluva brilliant idea! your kimchi reduction is beyond awesome – and i too have a jar of kimchi that needs to be put to one gloriously tasty use. thanks, Jes! also – i’ve never roasted cabbage before, but i’m gonna now. w00t! That is so genius, I love it! Kimchi is one of my favorite things and I bet this takes it to a whole new level. Thank you for this awesome idea! WOW! Jes your innovation always amazes me and that sounds like an AMAZING day!!! I can’t wait till classes are over… one more week for me! Ohhhh! Looks sooo good. I love the cabbage on the side! What a concept… Never thought about doing anything with kimchi other than serve it as is! Really like the idea though! Kevin will win fan favorite for sure, he is the best! I wish I had a fry daddy, I love deep frying but it is such a mess on the stove. Deep fried brussels sprouts/cabbage sounds soo good. Gosh I love Kimchi…that looks so f’in good! And thank you Working for the man isn’t exactly the best, but ya gotta do whatcha gotta do. I actually kind of like it. I get off of work all jazzed from sitting and am ready to cook!